Objective statement: A short statement about the type of position you are looking for. Keywords that target the position you are applying for can be included. Skills: Outline some of your key skills and abilities with a focus on those relevant to the particular position you are applying for. Categorize your skills into up to five different skill sets focusing on those skills in each set that are relevant to the position you are applying for. Formal qualifications and certifications: Include all of your nursing schooling in the resume. Nurse practitioner schooling generally includes a Master of Science Nurse Practitioner program and a Bachelor of Science in Nursing. Provide the name of the school, the date graduated and the degree. Certifications such as your Nurse Practitioner certification and you RN license should be included as well as any others you have earned. Employment history: List all previous nursing employment beginning with the most recent, and a summary of what your duties were in each job. You should be specific when discussing what area of nursing you worked in. Using a nurse practitioner resume sample as a guide for writing your own resume can be useful to ensure you don’t inadvertently leave something out. However don’t use the same wording that the sample nurse practitioner resume uses as you should target your resume for the specific job you are applying for. 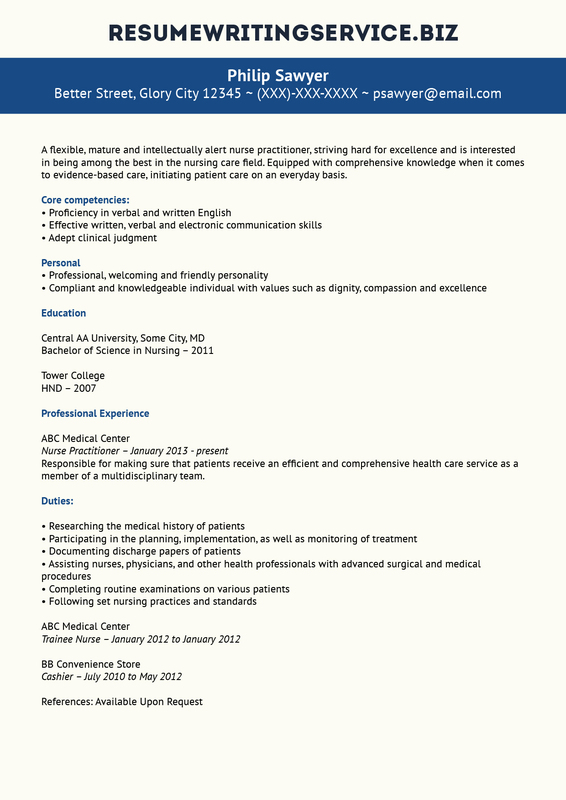 Have a look at a staff nurse resume to follow some general rules of formatting and styling. Is the resume neat and easy to read with a good balance of white space and text? Does the resume fit the page with no cramped appearance? Is important information highlighted using bold, italics or underling? Is all nursing school information included with correct dates? Invest enough time writing and proofreading so that the resume you submit looks professional and makes the right impression. Looking for a nursing assistant resume? We’ve got a nice sample prepared for you! There are more than 192,000 nurse practitioners (NPs) practicing in the U.S. according to the American Association of Nurse Practitioners. The U.S. Bureau of Labor Statistics 2014-15 Occupational Outlook Handbook says the median annual salary for nurse practitioners is $89,960. Salaries vary based on location, experience and a number of other factors. The highest paid 10 percent average $126,250 per year and the lowest paid 10 percent average $66,960 yearly. Nurse practitioner employment is projected to grow 34 percent through 2022. For nurse practitioner resume help, get in touch with us today!